The ketogenic diet has generated quite a buzz in recent times, which is no wonder as it is one of the few diets which have been proven scientifically to actually work. Still, there is no magical trick to it, but it is not something that happens without much effort on your side. It is a strict dieting regime, which calls for a lot of discipline, and it also needs to be accompanied by a carefully planned workout routine. This is where various keto lifestyle supplements steal the spotlight. There are a large number of such products available on the market, so it isn’t an easy task to find and choose the one that will best fit your needs. Read on to find out all about one of the most popular ones. As the name suggests, this supplement is meant to kick-start your state of ketosis. In case you didn’t know, that’s when your body switches from burning carbohydrates to burning fat for energy. You have to limit the consumption of carbs to prevent your body from switching back to carbs as its main fuel. This is the basic principle of the ketogenic diet. In addition to helping the obese and overweight, this supplement can also be used for boosted levels of energy and an increased mental focus, both of which are also characteristic of the keto diet. There are people who only use exogenous ketone supplements like this one without any major adjustments to their diet, but that’s not something we suggest. These supplements are meant to help you with the diet, and not be its foundation. It is well-suited for all those who are just starting their Keto lifestyle and are in need of a diet supplement to help them reach the state of ketosis much faster. Of course, supplements like this are not meant for kids and they surely aren’t meant for all adults either. Pregnant women should steer clear of these, and if you have a history of heart-related medical conditions, you should definitely consult your doctor before taking any. The Keto-Kickstart from iThrive Nutrition is a drink mix, and unlike most of its rivals, it only comes in one flavor. Luckily enough, it is quite an interesting one – Blue Raspberry. As it contains BHB salts which are known for their potent keto benefits, you are probably wondering about the taste. These salts are known for tasting rather unpleasant, but the good folks at iThrive Nutrition have somehow managed to balance it all out. It actually tastes quite good, and it doesn’t leave a foul aftertaste. If you still don’t like the taste, you can even mix it in other drinks, as long as they’re non-alcoholic, of course. Upon digestion, the Keto-Kickstart raises the levels of ketones in the bloodstream, with the whole process taking about half an hour. It is also efficient at reducing food cravings, which can be a problem when you first go on a low-carb diet. Also, this supplement is made in the US, and is certified GMO-free. Beside artificial flavor, it is preservative free and it also doesn’t contain any animal byproducts, so it is suitable for those who prefer a vegan lifestyle. The Keto-Kickstart can also be used by those who are on a Paleo diet regime, and it is great news that it is lactose-free, unlike some of its competitors. While there are no set rules about this, it is always best to follow the instructions given by the manufacturer. You can take it before or after your meals, but you should read the instructions for proper dosage, otherwise your stomach might get upset, especially if you make a concoction that’s too strong. You will maximize its potential if you’re also on the keto diet. This is a market with countless options and alternatives, so it isn’t always easy to find the right one for yourself. 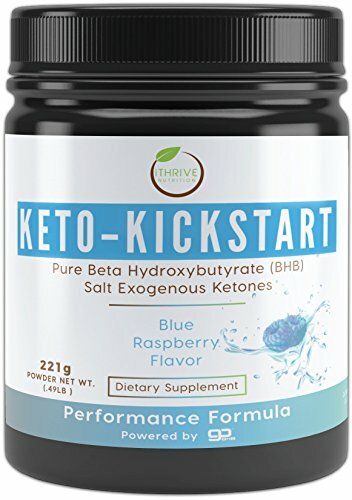 Even though the Keto-Kickstart comes from a reputable company, you still might want to try out something else. In that case, we would like to suggest the Keto Drive from ZHOU Nutrition. This is the best-selling product on the market and it comes in three different flavors. Also, it is very competitively priced so you might want to see for yourself what the buzz is all about. Finding the right supplement for your new found Keto lifestyle isn’t an easy task, and in most cases, it requires a lot of trial and error. The Keto-Kickstart is a drink mix that you can mix with water and drink it like that – almost like Gatorade – or you could mix it in smoothies and other drinks. However, we suggest you have a look at our top recommended exogenous ketones supplement.